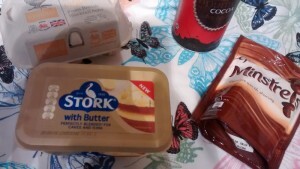 A while ago I was contacted by Stork, to see if I fancied creating any of their cakes using their new Stork with butter. 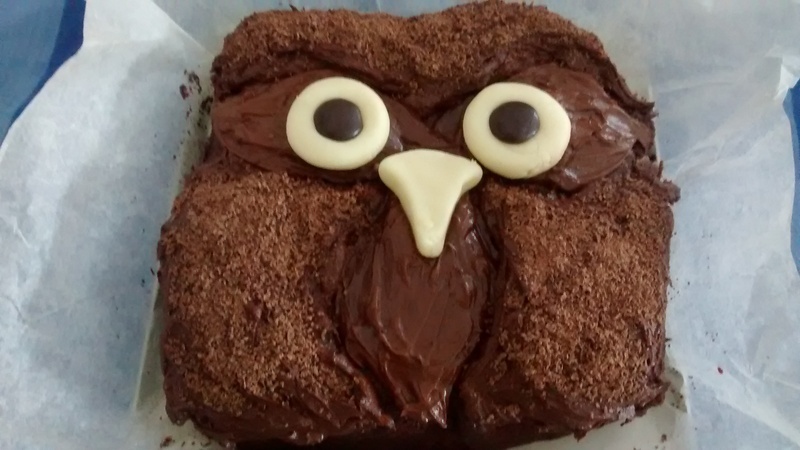 Well, I came across this amazing looking owl cake, and knew I had to have a go. They kindly sent me a voucher for the ingredients, so after buying what I needed, I set to work. 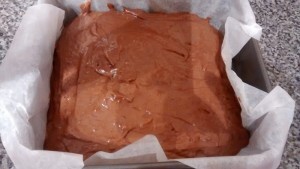 Making the chocolate cake was fine- I liked the addition of the milk and lemon juice- you do that in a red velvet cake to imitate buttermilk and it makes the cake lovely and light. I baked it for less time though, but that might be down to my oven. I kept the cake in the baking paper (I did loosen the paper) because my only tin big enough for a plate was at school after the bake sale. I made the owl eyes and beak with marzipan, because I like that more than sugar paste (and a minstrel for the centre of each eye). I put the first batch of buttercream on, and then disaster ensued. Basically, my kitchenaid mixer has two switches- one to raise and lower the top of the unit, and one to turn it on. I had raised the unit to add more cocoa powder to the icing (to make it darker) but instead of switching the right one to lower it, I moved the left one which turned it on. Now, you might think that it would not work if the unit was raised. Well, it does. So it sprayed chocolate buttercream all over me, all over the kitchen, all over the floor. Argh! Anyway, after stopping to clean up, I added the darker buttercream, and then some grated chocolate. It was very well received on Sunday. I was really pleased with how it turned out. It looked very impressive, but actually (with a bit of patience) the end result was fairly simple and I would certainly make it again. *I was sent a voucher to cover the cost of ingredients. All opinions are my own. This looks absolutely fabulous Maria! It ‘seems’ relatively simple to recreate, but I know if I tried it, it wouldn’t look anywhere near as good as your one does! Who did you share it with?! It was for Sunday tea with Andy’s family- none left! Yeah you definitely win in the “what would be worse to spray all over the place” game. Bit of a sticky nightmare! The cake though is FANTASTIC. I love owls and I love cake so really this is like my perfect cake (well, all cakes are my perfect cake I think but this one especially so!). 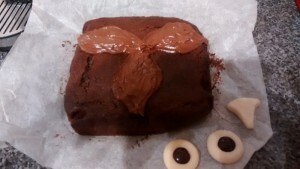 Really clever with the marzipan (yum) and Minstrels to make the features. Yes, although sadly I didn’t get to eat any of the marzipan! I love this Maria! I’ve only ever been able to bake sandwich cakes and feel that I lack the cake decorating skills to try anything like this. Give it a go, I bet you would manage it. Haha, I love this! Although, I am a little scared of owls. I don’t know what it is about them, but they just freak me out a bit. They are a bit intimidating if you see them in the wild. This looks delicious and really professional!